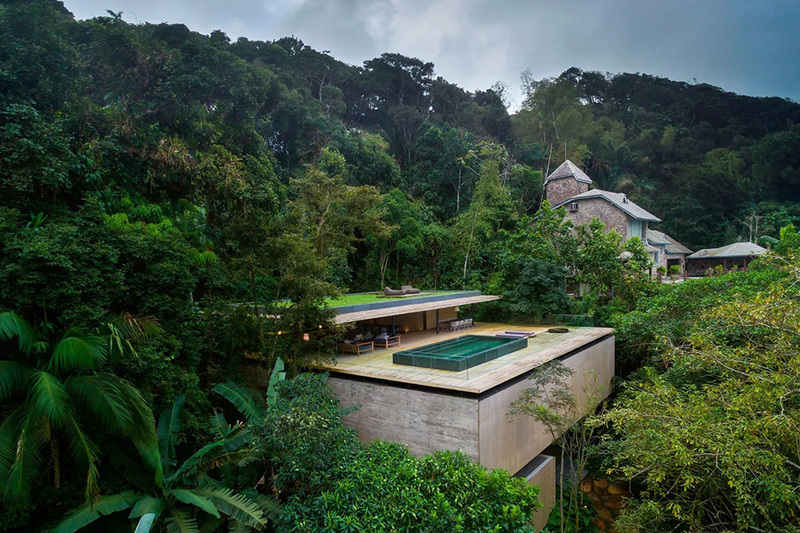 Architecture design maestro Studio MK27 has designed and built a stunning apartment, nestled in the dense vegetation of the Brazilian rainforest. “Casa Na Mata” (The Jungle House) lies just west of the Paulista shore and attempts to bring nature and modern living closer together. It sits high above the trees on the side facing outwards, enabling a stunning view towards the shore, and behind the house the trees sit high above, giving the impression that the house is naturally set in the landscape. The ground floor houses a large covered wooden deck, connected to a small room for children. On the first floor there are six bedrooms – five of them with small verandas with hammocks – and a TV room. The third, most spectacular floor is the social area of the house, including a swimming pool, a living room, and the kitchen. It looks like the kind of house to which James Bond would retire. Check it out below.